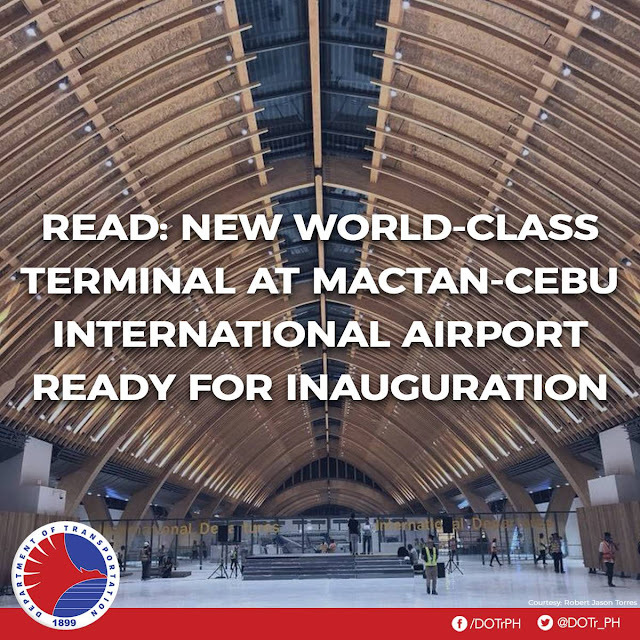 Envisioned as the world’s friendliest resort airport, the Mactan-Cebu International Airport’s (MCIA) Terminal 2 (T2) building is set to be inaugurated today, 07 June 2018. The inauguration will be led by President Rodrigo Duterte, Department of Transportation (DOTr) Secretary Arthur Tugade, key cabinet members, senators, congressmen, and executives from the private partner, GMR Megawide Cebu Airport Corporation (GMCAC). Construction of the new terminal building officially started in June 2015, with the aim of reducing airport congestion and increasing the airport’s annual passenger capacity from 4.5 million passengers per year to 12.2 million. “It was our job to make sure that construction will be completed by June 2018 as stated in the contract, and that’s what we did, and that’s why we are here. No delays, no corruption,” said Secretary Tugade. The new terminal was designed in collaboration with world-class Cebuano and Filipino artists, as well as international design and architectural firms, with the aim to provide a welcoming ambiance that is distinctly Filipino. With a floor area of 65,000 square meters, twice more than the 27,000 minimum floor area in the concession agreement, the new terminal is designed to increase the airport’s total handling capacity. Part of the “Build, Build, Build” infrastructure program, the MCIA Terminal 2 will start commercial operations on July 1. The new terminal will cater to international flights, while the existing Terminal 1 will handle domestic flights. The MCIA is the second largest airport and one of the busiest airports in the Philippines. As the premiere gateway to the Visayas and Southern Philippines, it is currently handling an estimated of 5.9 million passengers per year, which is beyond its capacity of 4.5 million passengers per year.